PRS USA Custom 24, (Serial #203150) in Grey Black Ever since it's introduction to the music world at NAMM 1985, the PRS Custom 24 has remai.. Ever since it's introduction to the music world at NAMM 1985, the PRS Custom 24 has remained the company's top-selling instrument and has continually evolved to the meet the demands of working professional guitarists in the subsequent years. 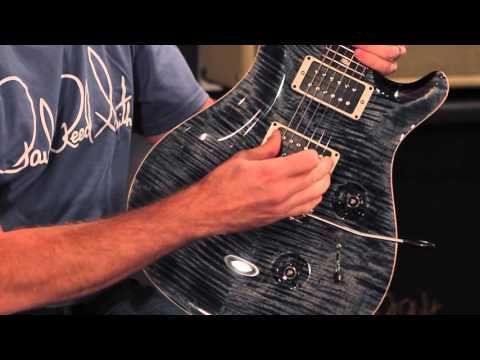 This prime example of PRS ingenuity is the go-to guitar for many of the world's top professionals, and provides you with a vast amount of versatility with regards to tonal choices and playstyles. Put simply: this guitar is PRS's music industry workhorse, and is available here in a gorgeous Grey Black finish. As with all PRS Custom 24 guitars, this one features the famous 85/15 pickup system (with 5-way blade switch, see below), as well as a PRS Patented Gen III tremolo and a solid mahogany pattern regular neck. The Custom 24 is a veritable workhorse of an instrument, and would be a welcome addition to any discerning guitar players arsenal. The mahogany body of the Custom 24 helps deliver the kind of warm and woody tones that we've come to expect from a top quality PRS guitar, and the natural grain of the Carved Figured Maple top wood helps give the Custom 24 it's striking appearance, especially when combined with this Jade finish. The Pattern Regular mahogany neck offers a supremely comfortable playing experience, and is suitable for most playstyles and musical genres. With 24 frets, a Rosewood Fretboard and those hallmark PRS Bird inlays, this Custom 24 looks and feels every bit the professional-grade instrument that you'd expect from a company like PRS. The excellent pickups housed in the Custom 24 give you a vast array of tones with which to play around, thanks largely in part to the incredible 5-way Pickup Selection system. Add to this a tone and volume control, and you have yourself an incredibly versatile guitar that would suit just about any musical situation. When it comes to PRS core guitars, such as the Custom 24, you know that the price is going to reflect the quality you're paying for. However, here at PMT we have a range of finance options available for you to choose from (including 0% interest) to help you spread the payments out over several months, and to let you purchase that special guitar you've always wanted. If you have any queries regarding our payment options, please contact our sales team directly on 0151 448 2080. This particular Custom 24 is currently sitting in our PMT Birmingham store, so if you live locally feel free to head into the store and request a demonstration with one of our product experts. If you order the guitar online before 3pm today though, you will qualify for our fast, free and reliable next-day delivery service (UK customers only, whilst stocks last).